The first US specification Bugatti Chiron is to go under the hammer next month, with an estimate of $3.5m to $4m dollars. It is painted in a unique black and red colour scheme and is unregistered, having driven just 250 miles around the firm's Molsheim factory in France. It is also the first Chiron to ever be offered at auction with an estimate between £2.6m and just over £3m at current exchange rates. The Chiron is Bugatti's successor to the incredible Veyron hypercar. First shown to the public at the Geneva Motor Show in 2016, the model is capable of some truly impressive statistics. While it 'only' has an electronically limited top speed of 261mph, it is thought that with this limiter removed it would be capable of over 280mph from its 1,479bhp 8.0-litre W16 engine. It is capable of hitting 60mph in just 2.5 seconds and can reach 249mph in 39 seconds. Just 500 are going to be built, and only a small number of these have been delivered to customers so far. 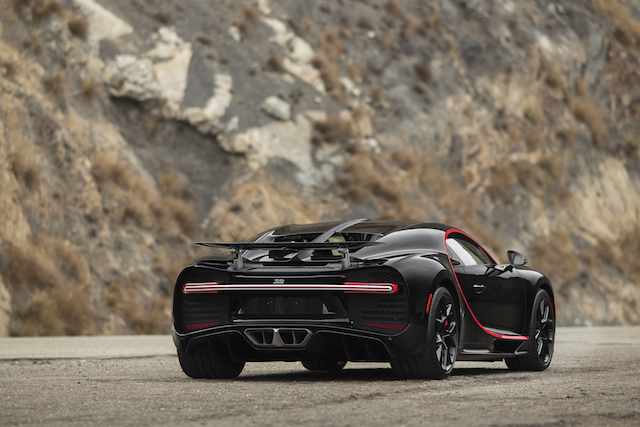 The Chiron being auctioned here was the first ordered for the US market. It also comes with a 1:8 scale model of this exact car, a US-specification rear bumper and a Bugatti 'crate' that comes with an extra key, the speed key to unlock extra performance, a car cover and more. It is being sold by RM Sotheby's at its Icons sale in New York on December 6. The auction house said: "The opportunity to acquire this Chiron marks the very first occasion that one has been offered at auction and represents a tantalising opportunity. The winning bidder will take delivery of what is unquestionably the most anticipated car of the year."